The environmental community has quit trying to influence the U.S. Congress. Unless Citizens United is overturned, there’s no hope of a comprehensive energy reform bill that must place alternative sustainable energy ahead of business as usual fossil fuel interests. Even when oil was well over $100 a barrel and we had (and have) an enormous glut of oil reserves, Congress wouldn’t even discuss eliminating oil subsidies. And at the same time, alt right Republicans labeled incentives for wind and solar as socialist plots to undermine America’s energy independence. Red state legislatures, regulatory agencies and consequently their state courts are joined at the hip with fossil fuel corporations. Pennsylvania, Ohio, Michigan, Wisconsin, North and South Dakota, Iowa, Missouri, Iowa, Oklahoma, Texas, Louisiana and even some in blue states Illinois and California have sold their souls to the drilling, fracking, injecting and pipeline devils and forsaken the health and safety of their residents. When America can’t depend on their elected officials (Sorry Flint) to protect its citizens basic rights of life, liberty and the pursuit of happiness, our political process is broken and democratic principles destroyed. Even though alternative energy is growing exponentially and getting cheaper by the hour, red states routinely side with fossil fuel, and oppose wind and solar at every turn. Red state officials blessed with the greatest wind and solar potential often erect obstacles to residents willing to invest in those energies. But in spite of this opposition, even some red state sectors are joining the revolution. North Carolina (unlike sunny red states Florida and Arizona) has overcome staunch opposition, to become the number 2 state with installed solar, behind only California. Oil rich Texas (number one) and Iowa (number two), now produce more wind energy than they can reliably deliver to cities in need because of a lack of infrastructure. The potential for renewable energy is irrefutable. Depending on who’s opinion you use; “Sunlight Striking Earth’s Surface in Just One Hour Delivers Enough Energy to Power the World Economy for an Entire Year.” or “In 14 and a half seconds, the sun provides as much energy to Earth as humanity uses in a day.” or There’s enough wind energy potential within the corridor from Texas up through Illinois to power the entire nation, if only the electrical power grid infrastructure were in place. Our Energy Department has invested in tidal research but we haven’t scratched the surface of that energy. Although our U.S. government and military have put more than $330 million into marine energy research over the past decade, Britain and Europe have invested more than $1 billion. We can do better. The DOE believes 20 to 30% of America’s energy could come from wave energy. They just announced our first wave generated energy went online this week in Hawaii. The power travels by undersea cable to a military base, where it feeds into Oahu’s power grid. The environmental and progressive communities have joined Native American sovereign nations (the original environmentalists) because we believe they have the advantage of being almost universal in their opposition to fossil fuel interests and in their desire to protect their soil and water. If our U.S. Congress is serious about honoring their treaties with sovereign Nation Tribes, they must not bulldoze their lands and jeopardize their water. The world is watching. Standing Rock Chairman Dave Archambault II spoke to the 49-member U. N. Council today in Geneva Switzerland, in opposition to the Dakota Access Pipeline. Canada and America are under siege from Canadian Company Enbridge’s Pipeline Network Expansion. We opposed Enbridge when they wanted to run pipeline 78 across our organic farm. That pipeline joins with Flanagan South pipeline at Patoka, IL, the termination of Dakota Access. When we refused to sign the easement, they filed an eminent domain action. You can read our story at gofundme.com/2xpggwfw. The Texas state legislature (and legislatures in other red states like Oklahoma, Ohio and Pennsylvania as well) have overturned any attempt by cities and communities to place common sense local restrictions on drilling, fracking, injection wells and pipelines. You can drill, frack, inject or place pipelines within shouting distance of homes, schools and businesses. And their state Environmental Protection Agencies turn a blind eye, as they did in Flint, Michigan. Who in their right mind would invest hard earned money in a home or business in these environments? And why would voters reelect candidates who would devalue their homes, properties and communities? If you’re a true conservative, you must favor alternative sustainable energy over fossil fuel. If you believe in god and his blessings of clean air, fertile soil and pure water, then you must support the Standing Rock Earth Protectors. And if you worry about your children’s and grand children’s future, you must vote in November for only earth protectors. This election is an important turning point in the fight to preserve humanity. If your candidates deny climate change or say they aren’t scientists and don’t know enough to make rational decisions about our climate and comprehensive energy reform, kick them to the curb. They’re too ignorant to deserve your vote. More than 100,000 protectors, Native tribes, farmers, landowners and activists from Bold Nebraska, the Sierra Club, IL Climate Activists, 350.org, Bold Iowa and others, inspired President Obama to decide against approving Keystone XL. I believe American’s can stop Keystone clone Dakota Access and also shut down Line 3 and it’s replacement if we stand up in unprecedented numbers. It’s our responsibility as thinking human beings, to oppose and delay the damage being done by fossil fuel interests, including the banks and investors they’re leveraged to, until sustainable energy can prevail. More than 100,000 concerned folks have already shown support for this peaceful Native American DAPL protest and donated close to a million dollars to their valiant cause. The Sacred Stone Camp Protectors have earned the respect and support of America’s environmental and progressive communities. Native Americans have a sacred and spiritual connection to their land and water. They and most farm families cherish the blessings Americans have been given with fertile land and pure water. I believe the only hope of stopping this pipeline insanity lies with President Obama and an executive order. But President Obama has stated many times that he can’t act alone. Common Sense American’s must stand up in such numbers that the President can’t ignore his duty to protect our environment. Please Vote in November for earth protectors! Michele May I share your comments? Very well presented and your story is one others should hear. John Enbridge is a Canadian company. No matter how many different convoluted entities they form down here, they are still a foreign company. A foreign company taking American’s property by eminent domain in violation of the 5th Amendment to the U.S. Constitution. And while the crazies are worried that our guvment will take their guns away, corporations are stealing the land, water and minerals right out from under them. Michele Go Standing Rock Protectors and Iowa Farmers. I wish I could post that!! That’s it in a nutshell. I love it!! John Sorry, And none taken. I was only talking about the folks who are duped by and obsess over those issues that divide us instead of the important things that should bring us together. I knew Native American tribes and protesting landowners couldn’t rely on our state courts to save America’s precious water and valuable farmland from the Dakota Access Pipeline Operators. Red State courts are joined at the hip with the fossil fuel industry. I also believed there was only a slim chance U.S. District Judge Boasberg would rule in favor of the Standing Rock Sioux. Once the Army Corps approves these pipelines, its a done deal. They’re routinely rubber stamped by controlling State agencies; the Public Service Commission in North Dakota, the Commerce Commission in Illinois (ICC) and the Iowa Utilities Board, a three person board appointed by Republican Governor Brandstad. Once the pipeline company is granted eminent domain authority, they threaten and intimidate landowners into signing easements. And that authority ties the hands of state courts. The only issue these state courts then rule on is the compensation to the landowners. And its seldom in the landowners favor. Landowners aren’t even allowed to testify concerning the value of their own land, no matter how many generations (Centennial Farms) they’ve owned that land. Enbridge (who just purchased 49% of DAPL) wanted to run pipeline 78 across our organic farm. Pipeline 78 and Flanagan South pipeline join Dakota Assess at Patoka, IL. The easement they wanted, granted them the ability to “abandon in place” when they’re finished with the pipeline. We know landowners and the American taxpayer will be stuck digging up the more than 250,000 mile of rusting pipelines, leaking into our precious water supplies. When we refused to sign the easement, they filed eminent domain. We lost in state court; but appealed the case. You can read about our fight against Enbridge at gofundme.com/2xpggwfw. Based on that fight, I believe the court action blocking eminent domain actions against Iowa landowners and farmers is only a temporary obstacle for DAPO. Those landowners can only hope their case is eventually decided by the Iowa Supreme Court. This abuse of eminent domain principles by private and foreign corporations for private gain not only violates the 5th Amendment to the U.S. Constitution but also violates Native American treaties and sovereignty, and should be roundly condemned by state supreme courts and eventually the U.S. Supreme Court. Even though many of these state courts are packed with very conservative, business friendly judges, I just can’t believe any true conservative would favor these private interests over property owners. A Pennsylvania appeals court rejected an action by Sunoco to dismiss a challenge to it’s Mariner 2 pipeline. Environmental group, The Clean Air Council can now argue against the company using eminent domain to build the pipeline. Based on this joint decision, it appears the administration is willing to revisit the impact of these fossil fuel time-bombs in the context of these larger issues; and also on global warming and climate change, as they did with Keystone XL. Canada, North and South Dakota, Minnesota, Wisconsin, Michigan, Illinois, Iowa, Missouri, Oklahoma, Texas and other states are under siege from Canadian Company Enbridge’s pipeline network expansion and their mad rush to blanket America in pipelines before sustainable energy progress makes fossil fuel assets obsolete. Enbridge recently announced they would cancel plans for the $2.6 billion, 616 mile Sandpiper Pipeline Project, a pipeline running from the Bakken field in North Dakota, across Minnesota (land of 10,000 lakes) to Superior, Wisconsin. Enbridge blamed low energy prices and “extensive and unprecedented regulatory delays and irregularities,” (Go Minnesota). But Sandpiper faced strong protests from environmentalists and Native American tribes. The Minnesota Pollution Control Agency said the pipeline would have crossed 28 rivers, lakes and wetlands. These threatened, ecologically sensitive areas couldn’t be reached by existing roads. How could Enbridge have possibly discovered, controlled or re-mediated an oil spill? (Google Kalamazoo River Oil Spill) Enbridge has instead invested $1.5 billion in this Bakken Pipeline System (DAPL). WELL LETS CERTAINLY HOPE SO! We need infrastructure projects beneficial to all American’s (including Native Americans) and not just oil, gas and pipeline companies, their executives and their financial benefactors. America needs comprehensive energy reform, not a country riddled with oil, gas and injection wells, oozing and leaking, contaminating fertile farm soil and precious water supplies and shifting our tectonic plates (Hello shaky Oklahoma). And instead of 250,000 miles of ticking time bomb pipelines, how about 250,000 miles of 100 ft wide bike paths. Can you even imagine the benefits. A big win, win, win; keep FF in the ground, save energy by biking instead of driving and at the same time, we improve our health and lower Obama Care costs. And they would cost a minute fraction of these pipelines. Alternative energy is growing exponentially and fossil fuels will must obsolete within 20 years, if mankind is to survive. Little Costa Rica’s electric grid has been powered entirely by its mix of hydro power, wind, solar, geothermal and biomass for 150 days so far this year. Since June 16th, they’ve gone 90 plus consecutive days and counting, in which all electricity has come from renewable resources. In 2015, they were powered by 99% renewable. Although Costa Rica is blessed with favorable alt energy potential, (80% of their power comes from hydro power) America can and must do better! We are blessed with substantial solar and wind power potential, if only we would take full advantage, instead of pandering to fossil fuel and their desperate campaign against wind and solar progress and subsidies. The “broadest public interest” must include the welfare of Native Americans, (the very first environmentalists) and everyone else who cherishes our blessings of clean air, fertile soil and pure water. I think the half dozen or more letters sent to the White House and signed on by 100’s of thousands of Native Americans, environmentalists, farmers, landowners and fed-up American’s, obviously had an impact on the President and his administration. Social Media (and not just in America) is watching and talking and commenting (even in Laos) and filming and they refuse to allow our Native American brothers and sisters to get dumped on again. And they’re sick and tired of the fossil fuel industry and their paid political lackeys, denying climate change, ignoring overwhelming scientific proof of global warming, controlling the energy agenda by refusing to support comprehensive energy reform and obfuscating and fighting at every turn (Exxon Mobile), the potential of sustainable alternative energy. But President Obama has stated many times that he can’t act alone. Lacking any support from the Republican controlled Congress, It will take overwhelming support from the American Public for him to take executive action. The DAPL opponent’s job now, is to turn the Army Corps “expeditious and timely resolution” into a peaceful slow walk. If they can stall this pipeline through this winter, anything can happen. Cushing, Oklahoma can’t find anywhere else to stockpile surplus oil. And all those earthquakes are striking closer to those storage terminals. More than 100,000 water and soil protectors, Native tribes, farmers, landowners and activists from Bold Nebraska, the Sierra Club, IL Climate Activists, Bold Iowa, 350.org and others, inspired President Obama to decide against approving Keystone XL. This stand by the Native Tribe’s affiliated with the Sacred Stone Camp has struck a nerve with America’s environmental and progressive communities. Unlike fossil fuel proponents and their political panderers, these Native Americans have a sacred and spiritual connection to their land and water. They and most farm families cherish the blessings Americans have been given with fertile land and pure water. John, Rich Not all of them, just the ones that don’t know the difference between oil and water. We stand with Dakota Access water protectors. We fought to protect the well on our small organic farm in Illinois. 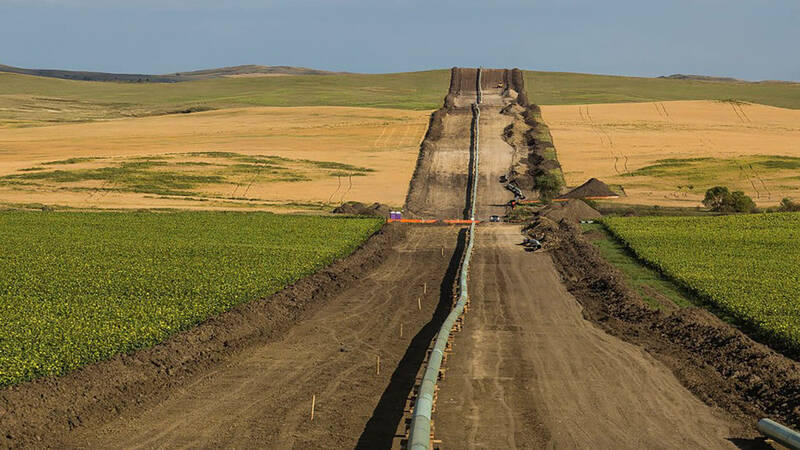 Canadian Co. Enbridge, who just purchased 49% of DAPL, wanted to run line 78 across our farm. Line 78 connects with Flanagan South and then DAPL at Patoka, Illinois. Our fight with Enbridge is at gofundme.com/2xpggwfw. We also joined many environmental organizations in the Midwest trying to protect the Great Lakes, which holds one fifth of the worlds fresh water. Our well water comes from the Great Lakes Basin aquifer. We’re involved in the fights against the onslaught of Enbridge’s pipeline expansion in the Great Lakes region. We support the efforts to shutdown line 3 and it’s replacement in Wisconsin, and line 5, which runs through the straights of Mackinac. We supported Minnesotan’s who stopped Sandpiper. We support those fighting against Plains pipeline company trying to get approval to ship heavy crude through a 98 year old pipeline (built in 1918) that runs under the St Clair river and upstream of the Detroit and other communities water intakes. We don’t need another Flint. Michigan disaster. The simple fact is that there are no safe oil pipelines, especially tar sand pipelines. This is why the Standing Rock Protectors fighting DAPL, are standing their ground and will not give up. Pipelines are: made of steel, buried in the ground, sometimes underwater, carry corrosive substances (even sand particles), under extremely high pressure and subject to corroding, rusting, delaminating, chemical reactions and bursting wide open. And all the assurances given by pipeline companies that they have the latest safeguards are bull pucky. In every pipeline spill, the autopsy was the same: “the pipeline company failed” (fill in the blank), to detect, to respond to, to respond to quickly enough, to get to the remote location, due to inclement weather, by thinking the alarms were a mistake, by stopping the pumping but then starting again. The NTSB described Enbridge’s response to the Kalamazoo River spill as “the Keystone Cops.” That 2010 tar sand spill is still not fully cleaned up and never will be. They just purchased 49% of Dakota Access. This Montana pipeline was 20 year old. Kalamazoo River line 6B was 40 years old and had at least 15,000 defects. The Santa Barbara pipeline was 46 years old. Google the pictures; it looks like a 50 year old excavated tin can. Some recent spills in Alberta were in very young pipelines (one was only 2 years old). The 65 year old Enbridge Line 5 pipeline under the straights of Mackinac, could contaminate at least 2 Great Lakes and at least 700 miles of shoreline in Canada and the U.S. if it bursts. And if that’s not risky enough, Plains pipeline company is trying to get approval to ship heavy crude through a 98 year old pipeline (built in 1918) that runs under the St Clair river and upstream of the Detroit and other communities water intakes. America, you’ve lost your Fracking mind! Red state legislatures, their regulatory agencies and consequently their state courts are joined at the hip with fossil fuel corporations. Pennsylvania, Ohio, Michigan, Wisconsin, North and South Dakota, Iowa, Missouri, Iowa, Oklahoma, Texas, Louisiana and even some in blue states Illinois and California have sold their souls to the drilling, fracking, injecting and pipeline devils and forsaken the health and safety of their residents. The potential for renewable energy is irrefutable. Depending on who’s opinion you use; “Sunlight Striking Earth’s Surface in Just One Hour Delivers Enough Energy to Power the World Economy for an Entire Year.” or “In 14 and a half seconds, the sun provides as much energy to Earth as humanity uses in a day.” or There’s enough wind energy potential within the corridor from Texas up through Illinois to power the entire nation, if only the electrical power grid infrastructure were in place. Our Energy Department has invested in tidal research but we haven’t scratched the surface of that energy. Although our U.S. government and military have put more than $330 million into marine energy research over the past decade, Britain and Europe have invested more than $1 billion. We can do better. The DOE believes 20 to 30% of America’s energy could come from wave energy. They just announced our first wave generated energy went online this week in Hawaii. The power travels by undersea cable to a military base, where it feeds into Oahu’s power grid. America’s first off shore wind farm went online last week and will produce enough energy for 17,000 homes. If you’re a true conservative, you must favor alternative sustainable energy over fossil fuel. If you believe in god and his blessings of clean air, fertile soil and pure water, then you must support the Standing Rock Earth Protectors. And if you worry about your children’s and grand children’s future, you must vote in November for only earth protectors. This election is an important turning point in the fight to preserve humanity. If your candidates deny climate change or say they aren’t scientists and don’t know enough to make rational decisions about our climate and comprehensive energy reform, kick them to the curb. They’re too ignorant or corrupt to deserve your vote. I believe American’s can stop Keystone clone Dakota Access, shut down Line 3 and it’s replacement and eventually shut down line 5, if we stand up in unprecedented numbers. It’s our responsibility as thinking human beings, to oppose and delay the damage being done by fossil fuel interests, including the banks and investors they’re leveraged to, until sustainable energy can prevail. Tommy I am in awe of your statement, in the point of view you come from. Frances Very well put! None could’ve said it better! Now people have a better understanding of how dangerous these pipelines are. I do anyway! I am a Native Member of the Lakota and am VERY concerned! John Corporations make decisions based on the bottom line of the next quarter. Native American tradition tells them to make decisions based on what’s beneficial for the next seven generations. What is best for humanity? Maia John Thank you for a wonderfully informative and passionate comment! John Maia Thank You. Just trying to do my part. Maia Richly descriptive and heartfelt report on the camps near Standing Rock, thank you. I very much appreciate that the focus here is not only on the present struggle against DAPL but on the overall, earth-wide struggle we must all be engaged in, inspired by native peoples everywhere. Starting today, I am contacting banks which are currently lending financial support toward the pipeline construction and asking them to consider what that support is actually doing, and putting at risk. Even if they do nothing, they will know that people care enough to write a letter of objection to what’s happening and each bank’s support of injustice. I urge everyone who wants to stop the DAPL to join me in this. If you would like a list of banks lending money toward DAPL and email/physical addresses, respond to this comment and I will copy paste the list I got from a YES article online. Or you can go to YES Magazine and look for the recent articles on DAPL and Standing Rock. Thank you. Twenty years from now, the oil industry will be the new coal companies, failing and bankrupt. Eco investors are bailing on fossil fuel. University endowments, pension and green funds are divesting from fossil fuel and moving into sustainable energy. Communities are requiring utilities to produce a percentage of alternative energy. Investment in the dirtiest Alberta tar sands, has been cut by two thirds. Wind and solar are growing exponentially and costing less. There’s more investment in renewable energy than fossil fuels; and new employment surpasses oil, gas and coal combined. Renewable energy potential is irrefutable. “Sunlight Striking Earth’s Surface in Just One Hour Delivers Enough Energy to Power the World Economy for an Entire Year.” or “In 14 and a half seconds, the sun provides as much energy to Earth as humanity uses in a day.” or There’s enough wind energy potential from Texas up through Illinois to power the entire nation, if only the power grid were in place. Oil rich Texas (number one) and Iowa (number two), produce more wind energy than they can deliver to cities in need. Our Energy Department has invested 20 million dollars in tidal research but we haven’t scratched the surface of that energy. In spite of a glut of oil and gas, the fossil fuel industry is frantically installing the massive infrastructure needed to extract and export every ounce of oil and gas before America wakes up; or before alternatives make them obsolete. Dakota Access will cost at least $3 billion. Pipelines already in progress or planned will cost at least that much or more because they must cross ecologically sensitive areas in Minnesota, Wisconsin, Michigan and Illinois. If only this enormous investment by oil and gas companies drilling and fracking the earth apart, (hello shaky Oklahoma) and by companies like Enbridge blanketing America with risky pipelines, was instead directed toward renewable energy? Little Costa Rica’s electric grid has been powered entirely by its mix of hydro power, wind, solar, geothermal and biomass for 150 days so far this year. Since June 16th, they’ve gone 88 consecutive days in which all electricity has come from renewable resources. In 2015, they were powered by 99% renewable. America can and must do better! Fossil fuel pandering politicians, cherish campaign contributions but could care less about American’s, their soil, their precious drinking water, and their children’s and grandchildren’s future. This election is an important turning point in the fight to preserve humanity. If your candidates deny climate change or say they aren’t scientists and don’t know enough to make rational decisions about our climate and comprehensive energy reform, kick them to the curb. They’re too ignorant or corrupt to deserve your vote. Canada, North and South Dakota, Minnesota, Wisconsin, Michigan, Illinois, Iowa, Missouri, Oklahoma, Texas and other states are under siege from Canadian Company Enbridge’s Pipeline Network Expansion. More than 100,000 protestors inspired President Obama to decide against approving Keystone XL. American’s can stop Keystone clone Dakota Access and shut down Line 3 and it’s replacement if we stand up in unprecedented numbers. It’s our responsibility as thinking human beings, to oppose and delay the damage being done by fossil fuel interests, until sustainable energy can prevail. Enbridge wanted to run pipeline 78 across our organic farm. Pipeline 78 and Flanagan South joins Dakota Access at Patoka, IL. The easement they wanted granted the ability to “abandon in place” when they’re finished with the pipeline. Landowners and the American taxpayer will be stuck digging up the more than 250,000 mile of rusting pipelines, leaking into our precious water. When we refused to sign the easement, they filed eminent domain. We lost in state court; but appealed the case because these illegal eminent domain actions by a private foreign company, violate the 5th Amendment to the U.S. Constitution. It also violates Native American Treaties and Sovereignty. You can read our story at gofundme.com/2xpggwfw. The Sacred Stone Camp defense has struck a nerve with America’s environmental and progressive communities. Native Americans have a sacred and spiritual connection to their land and water. They and many farm families cherish the blessings Americans have been given with fertile land and pure water. The only hope of stopping this pipeline insanity lies with President Obama and an executive order. Common Sense American’s must stand up in such numbers that the President can’t ignore his duty to protect our environment. Jeanette Well written….to the point…if you could sing and dance….get it down to 2 paragraphs…we have a chance…to move their bodies and charge their souls….create understanding in the needed goal…get up on stage and share you have hopes….believing is the key to rockin this boat. Sorry, couldn’t help myself. Very well written piece and I do wish people would take the time to really understand what is at stake…. John Jeanette Thank you. Sorry, a lot to cover. Author John HannoPosted on September 5, 2016 November 30, 2016 Categories EnvironmentLeave a comment on (Native) America’s Last Stand?